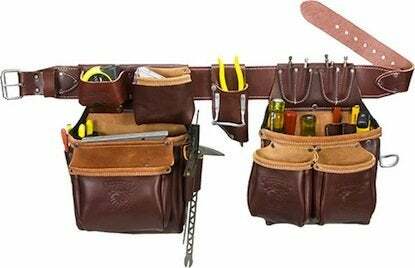 Don’t make the mistake of thinking that a tool belt is just for pros! Even if you’re just doing quick jobs around the house, you save lots of time and wasted motion by wearing your tools. Belts with two movable pockets are best; if you’re right-handed, keep your hammer, knife, pencil, pliers, and anything else you use with your dominant hand on that side. Keep nails and screws, square, chisel, and nail sets, the tools you use with your helper hand, in the other pocket. A center holder for your measuring tape is a good idea, and you can add magnetic holders for nails and screws and a clip for your power tools. If your belt feels too bulky or heavy, slide the pockets around to the rear or get a belt with padding and suspenders to spread out the load. Your tool belt does more than just help you work better: to climb a ladder safely, you need two hands. Once you get used to using a toolbelt, you’ll never go back!